A few weeks ago a good friend and sound man with whom I spent time in Long Kesh in the early 70s visited me in Leinster House. It was his 70th birthday and he and my brother Paddy and wee Harry came along to look around the place. He brought with him some poems he has written over the years. One in particular, ‘The Long Road’ was about the 1981 hunger strike and I immediately set it aside knowing that I would use it as part of remarks I was to make at the national hunger strike commemoration in Camlough. And I did. The march was yesterday and I used the poem to open my speech. The road through the long Bog ... Ten men walked them all. The crowd at yesterday’s march and commemoration was among the biggest I have seen in many a long time. It took almost one hour to pass any given point. The weather was generally good and with the hills of South Armagh all around us it was a beautiful setting to mark 30 years since that traumatic summer of ‘81. As well as marking the deaths of Bobby, Francie, Raymond, Patsy, Joe, Martin, Kevin, Kieran, Tom and Mickey, the commemoration also remembered Michael Gaughan and Frank Stagg. There were people from all across the island. And the organizing committee from South Armagh did a great job of planning the event, including a private gathering before hand at which presentations were made to the families of the hunger strikers. A glass presentation was made by the South Armagh organisers and Jack O’Patsy’s Pottery in Youghal in County Cork also made a special plate presentation which was given to the families. The event was notable for many reasons but not least for the numbers of young people who attended and participated. Emma McArdle chaired the commemoration and young people from across South Armagh read brief biographies of the 12 hunger strikers. 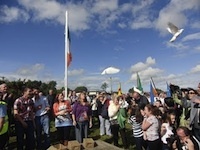 White doves were released, Paddy Martin played the uillean pipes, Ailin McIlwee sang ‘Raymond’s song’ and Paddy Quinn lowered the national flag during the minutes silence. I gave the main speech and I include most of it below. The hunger strike was 30 years ago. It was a watershed moment in Irish history. In the summer of 81 over 50 people were killed and many hundreds more were injured. 30,000 plastic bullets were fired mostly in republican Belfast and Derry. 7 people died as a result, three of them children, and countless hundreds injured. The hunger strike came at the end of a decade in which the British government had employed every conceivable weapon in its substantial military and political arsenal. Internment; torture; shoot-to-kill actions; rubber and plastic and lead bullets; CS and CR gas; curfews and mass arrests; black propaganda; special courts and special laws and an orange judiciary; sectarian attacks and collusion, and the withdrawal of political status for the prisoners in the H Blocks and Armagh women’s prison, were all part of a concerted British strategy. So too were its efforts to build political alliances with the SDLP and the Irish government. The British aim was simple - to protect British interests, and to defeat Irish republicanism and the struggle for Irish unity and independence. Despite its propaganda and lies the British government knew that republicans enjoyed a substantial level of support. So, severing the connection between the republican struggle and the people was key and criminalisation was a central part of this strategy. Breaking the prisoners was crucial. Chreid na Sasanaigh gurbh fheidir priosunai poblachtacha a bhuaileadh agus a sceimhliu chun eide coirpigh a chaitheamh, chun obair priosun a dheanamh agus a gcuid poblachtachas a threigeadh. [The English believed that it was possible for republican prisoners to be beaten and terrorised into wearing criminal uniforms, doing prison work and abandoning their republicanism]. They were supported in this by the northern and southern political establishment. But, as was so often the case throughout the centuries the British and their local allies misjudged the tenacity and resolve of Irish republicans, and in particular of the prisoners. Of the hundreds of prisoners in the H Blocks - naked, beaten, starved, denied proper medical care or toilet facilities, forced frequently to run the gauntlet of riot clad screws or subjected to the brutality of the mirror search. Of the women in Armagh - isolated and beaten and strip searched who were also denied adequate medical and toilet facilities. The political gains that have been made since then owe much to the men and women political prisoners and to the sacrifice, resolve and perseverance of the hunger strikers and their families. Bhi feachtas na bpriosunai dirithe ar 5 eileamh chun leasuithe priosuin ach i ndairire bhi an streachailt ibhfad nios doimhne na sin. The prison struggle, like the struggle on the outside, became a battle of will about the right of the Irish people to self-determination and independence and freedom. The prisoners knew that. So did the Brits. It was about uniting Ireland. That struggle continues today. And core republican objectives are at the heart of everything we do today. The Sinn Fein political strategy is about achieving these objectives. And let there be no doubt about it. We have a viable project and we have made, are making, and we will continue to make significant progress. 30 years ago the north was embroiled in war. British troops were dug in on these hilltops; people were dying in their scores; nationalist areas were under military occupation and unionists were entrenched behind their laager mentality. The Sinn Fein strategy brought the British and the unionists and the Irish government to the negotiating table. Thirty years ago there was an Orange State. The Orange State is gone. The Government of Ireland Act is gone. The right of citizens to opt for a United Ireland is equal to that of those who wish to retain the union. Sinn Fein is from that democratic tradition which believes that the British government never had any right to be in Ireland; does not have any right to be in Ireland and never will have any right to be in Ireland. There is now an entirely peaceful way to bring an end to British rule. Our duty is to develop democratic ways and means to achieve and to unite behind the leadership and the campaigns which will bring this about. Yes it will be challenging! Yes it will be frustrating! The enemies of change are strong. But that never stopped us in the past. Remember, once upon a time Margaret Thatcher - remember Margaret Thatcher? Remember she claimed that the north was as British as Finchley! It never was. Britain’s claim to the north is now reduced to a simple majority vote. Of course we have a huge job of work to do to persuade unionists of the merits of the republican and democratic position. But we are also in a very good place to do this. Sinn Fein is the largest nationalist party in the Assembly and on local Councils and we hold one of the three European seats. There are five Sinn Fein Ministers, including our leader Martin McGuinness, who as Deputy First Minister shares the Office of First and Deputy First Minister with Peter Robinson as an equal in all matters. The DUP and UUP, who opposed power sharing, are sharing power in government. There are all-Ireland political functioning institutions. And in all of these political institutions Sinn Fein is defending the rights and entitlements of all citizens and promoting our republican agenda for unity and equality. I mbliana ta meadu tagtha ar ionadaiocht pholaitiuil Shinn Fein sna comhairli aitiula agus sa Tionol sa Tuaisceart. In the Oireachtas today, we have a Sinn Fein team of 14 TDs and 3 seanadoiri. And in constituencies across the south, especially those where we came close to winning Dail seats, Sinn Fein is growing organisationally and electorally. In Leinster House our new Dail team is proving itself to be effective and efficient. For many we are now the real opposition party, challenging the Fine Gael and Labour government as it imposes a disastrous austerity programme and introduces new stealth taxes on working families. The fact is that Irish republicanism is stronger today than at any time since partition. Ach chun cuir lenar neart, chun tionchar pholaitiuil agus cumhacht nios laidre caithfidh muid ar streachailt a neartu. There is no more important time than this for the republican principles of equality, fraternity, and freedom. Ta polasaithe polaitiula bunaithe ar na prionsabail seo de dhith go prainneach chun leas ar bpobail. Republicans need to build our party. More people need to join Sinn Fein. More young people need to join Sinn Fein. We especially need more women to join Sinn Fein. To take up leadership positions. And we need to use our growing political strength wisely and successfully and well. Achieving our republican goals will not be easy. While Unionist leaders now see the benefits of working on an all Ireland basis, they remain opposed to a united Ireland. So there is work to be done peacefully and democratically with them. Sinn Fein is up for that work. The British government, despite its protestations to the contrary, and its systems, has yet to face up to its responsibilities to the people of this island. It can best do this by leaving us to manage our own affairs. The Irish government, and in particular the Irish political establishment, is partitionist. That is evident in so many ways, for example, in the resistance thus far, to extending voting rights in Presidential elections to Irish citizens living in the north. But there are many people in Ireland who want rid of outsiders ruling us whether from London or the IMF and EU. They want a free and united and independent Ireland. I believe there are many people in Ireland who share our goals of a free and united and independent Ireland. Tri neart pholaitiuil a thogail agus comhphairtiocht a chothu beidh muid abalta ar spriocanna amach. Sinn Fein is clear about our strategy, clear about our goals and clear about the road map to the future. We will not be distracted or put off course. We have a vision of a new future, a better future, and we have the spirit and the confidence to work with others to achieve this. Raymond McCreesh agus a 9 comradai agus na poblachtaigh go leor eile a thug a mbeatha don streachailt thar na blianta, chuidigh siad linn theacht go dti an ait a bhfuil muid inniu. There is an enormous responsibility on us to seize the opportunity they created and to make Irish freedom a reality. There is a role for everyone in this new situation. Let us stand together, united behind our republican goals. Bainimis ar saoirse amach agus togaimis Eire Aontaithe agus poblacht nua lenar linn. There is resistance to this. There was also resistance to the blanketmen and the women in Armagh. They knew this. But they kept their eyes on the prize. They were also aware of all of the developments in the campaign and the manoeuvrings by the British and others. They were not put off by any of this. They were steadfast in their determination. Struggle is hard. Activism can be challenging. There will always be cynics and begrudgers and naysayers. But there will also always be heroes and heroines. Ray McCreesh and his comrades set an example for every republican. They should be our role models. Let’s keep our eyes on the prize. “...at the end of the day everything returns to the primary consideration, that is, the mind. The mind is the most important. But then where does (the) proper mentality stem from? “If they aren’t able to destroy the desire for freedom, they won’t break you. “They won’t break me because the desire for freedom, and the freedom of the Irish people is in my heart. “The day will dawn when all the people of Ireland will have the desire for freedom to show.